AverMedia generally doesn't boggle us with cutting edge products, but they have their niche with those for whom money is an object. Though pricing hasn't been announced, the AverTV Box PVR announced at Computex seems to fit that mold, offering set-top recording and time-shifting, but foregoing niceties like network connectivity, HDMI output or even HD for that matter. The box can record to separate USB devices and output with analog VGA or RCA composite to a monitor or TV. While it appears to be SD-only, if your 20-year old Zenith wants to get in on some PVR time-shifting, it might have found a new best friend. Check the PR for more info. 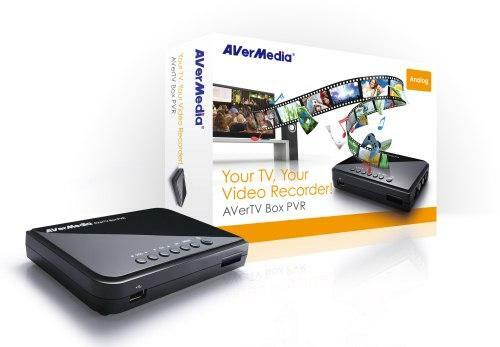 AVerMedia Technologies, Inc., the preeminent name in digital multimedia technology, today announced the availability of the AVerTV Box PVR, a standalone TV recording box used with TV set or PC monitor. The AVerTV Box PVR features direct file recording to USB hard drives directly, scheduled recording and TimeShift, which provide consumers the most convenient way to enjoy TV programs at any time. What's more, it is equipped with 3D Y/C separation technology that ensures the superior video quality. Besides TV recording, it can also be used to preserve your favorite video from various external source devices. With the advantages of ease of operations, high video quality and multi-use capability, the AVerTV Box PVR is the ideal and cost-effective solution for TV and video enthusiasts. The hardware and function design of the AVerTV Box PVR satisfies all the demands for live TV recording. Its inputs of TV antenna and composite video allow users to capture analog cable TV, as well as TV content from satellite/cable TV set-up-box. Due to its compatibility of both TV set and PC monitor, the product stands out from general TV boxes for PCTV to bring this delightful TV experiences to the living room. With only one press, the AVerTV Box PVR records your favorite variety shows, drama series, football games, and sitcoms to an external USB hard drive. Moreover, the device provides multiple recording options to ensure your ultimate TV entertainment. Besides real-time recording while watching TV programs, it is capable of cyclic scheduled recording with auto power on and off, which means capturing the whole TV series with one-time setting to save your trouble and electricity expense when you are away from home. Even better, its TimeShift function enables pause, fast-forward and rewind live TV clips so that no prime moments will be missed because of any sudden interruption, and those breath-taken moments can be re-played. What's more valued, the AVerTV Box PVR adopts the NEC chipset with advanced 3D Y/C separation technology, which helps to present higher video quality from analog TV signal due to the powerful noise reduction and color separation capabilities. AverMedia rolls out AverTV box PVR, likely targeting budget-minded ad-skippers originally appeared on Engadget on Tue, 05 Jun 2012 10:47:00 EDT. Please see our terms for use of feeds.